Play the Oktoberfest Mission on PartyPoker and win VIP tickets to a FC Bayern München football match at the Allianz Arena in Munich, Germany. This offer runs for a limited time and will end on 6th October, players must complete three simple missions to qualify for the Oktoberfest Mission Freeroll. 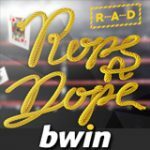 Bwin.Party are the official sponsors of some of the World biggest football teams including: Manchester United, Real Madrid and FC Bayern. Bwin and PartyPoker offer exclusive promotions to players with special football experience packages to be won. Qualify for the Oktoberfest Mission Freeroll where the top 3 players will win VIP tickets to attend a FC Bayern München football match in Munich. Complete three mission on the new PartyPoker software to qualify for the Oktoberfest Mission Freeroll. Players must pause any active missions before activating the new Oktoberfest Mission. 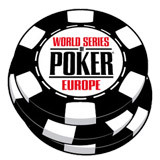 Players must complete all three poker missions during the promotional dates: 21st September until 6th October 2013 to qualify. 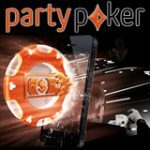 The PartyPoker Oktoberfest Mission is best suited for poker players based in Europe as there is no travel or accommodation included with the prize. 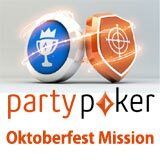 The PartyPoker Oktoberfest Mission promotion is open to players who have made a first deposit on PartyPoker. Winners are responsible for arranging their own travel and any documents needed to get to Munich, Germany. If players are unable to attend they can accept a cash alternative instead, 1st place - €1,500, 2nd place - €1,000 and 3rd place - €500. Winners will be notified within a week of winning the Oktoberfest Mission freeroll with the details of VIP tickets dates and times. 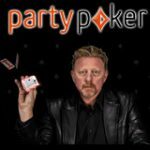 The all new Partypoker software has been released with some outstanding new features geared at recreational poker players. 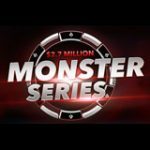 Unlock poker achievements, complete missions and earn rewards, think Zynga Poker on steroids with real money games available. 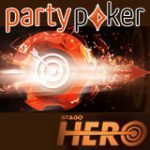 Partypoker also offer their version of a fast fold poker game called Fastforward Poker which offers high speed poker games. 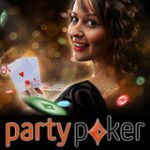 The Party Poker software is available in several formats including; PC, MAC, iOS devices and Android mobiles and tablets.